The Sounders have brought back most of the framework that allowed them the rare feat of traveling to consecutive MLS Cups to search for a third trip. Coach Brian Schmetzer spoke this week of the lasting disappointment of a failure on that frigid night in Ontario. “It served as a good goal for Toronto after they lost to us in 2016,” Schmetzer said. “We will use it the same way. Last season was a good season in many ways, but that sickness in our stomachs is still there. The MLS start of 2017 was not kind to the Sounders, who stumbled out to a 2-5-4 mark. Weary from a short, six-week off-season after a brutal campaign, the Sounders were unprepared to face teams gunning for the reigning champ. Eventually, the club found its rhythm. While the emptiness Schmetzer described will linger, a similar slow start in league play could well take place. Trophy or no, Seattle’s off-season lasted 43 days (Dec. 10 to Jan. 22), which hardly allows a body to recover from the strains of an MLS season that, including playoffs, lasted nine months. The toll already has commenced. Jordan Morris had a season-ending ACL tear in his right knee in El Salvador Feb. 22, near the end of the season’s first competition in CONCACAF Champions League. Osvaldo Alonso revealed Wednesday he expects to be out until mid-March, while Kelvin Leerdam, Roman Torres and Victor Rodriguez have all been similarly hobbled. Given such roster stress, it would not be unlikely for the Sounders to have difficulties early. 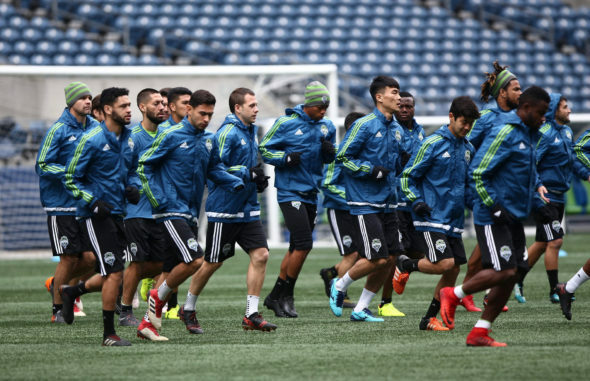 Fixture congestion with the Champions League will continue; a 4-0 Sounders victory over Santa Tecla Thursday night means that they will host Liga MX giant CD Guadalajara Wednesday, three days after Seattle’s season opener Sunday against expansion franchise Los Angeles FC (2 p.m., ESPN). A key roster question is who will replace the goal-supplying talents of Joevin Jones. The Trinidadian left back dished out 13 assists last season before signing with SV Darmstadt in Germany. Still, new arrivals may help distribute the burdens of playing time more evenly. Center back Kim Kee-hee from the Chinese Super League, midfielder Magnus Wolff Eikrem from Malmo FF in Sweden, and the depth signings of outside backs Jordan McCrary and Waylon Francis may help Seattle remain competitive while first-choice players are out. Only two other teams have been to at least three MLS Cups in a row. The New England Revolution were finalists from 2005-07, but never hoisted the trophy. The Sounders would rather emulate the success of D.C. United in the league’s first years. The Black and Red went to the finals four times from 1996-99, winning the title three times. Seattle seeks to be the third team to accomplish the feat. The high-profile acquisitions have gambling outlet Oddsharks.com listing the Sounders as No. 3 to become MLS champion, trailing Toronto and Atlanta, and first in the Western Conference. Didn’t tune into MLS Cup, because I was so steamed over the city signing the OVG arena deal Ithat week I didn’t want to watch anything Seattle sports. Then when I did peek in, Altidore scored, and that smug look on his face almost made me throw my iPad across the room. Haven’t had the heart tto see anything Sounders or MLS since.